Usually seeing a project progress gives me a lift. Something tangible is getting accomplished! But this year I've found I'm getting bogged down in projects. I haven't shifted my expectations to match my decreased knitting time. The result is little bags of half-finished stuff, stuffed in little places around my half-cleaned house. I miss monogamous knitting. So you can see my Drift's Ridge, on the left, which would've been done had I not flubbed the sizing. Cafe au Lait, center, is now stealing most of my knitting time, since it's part of the Holla Knits KAL that is underway. 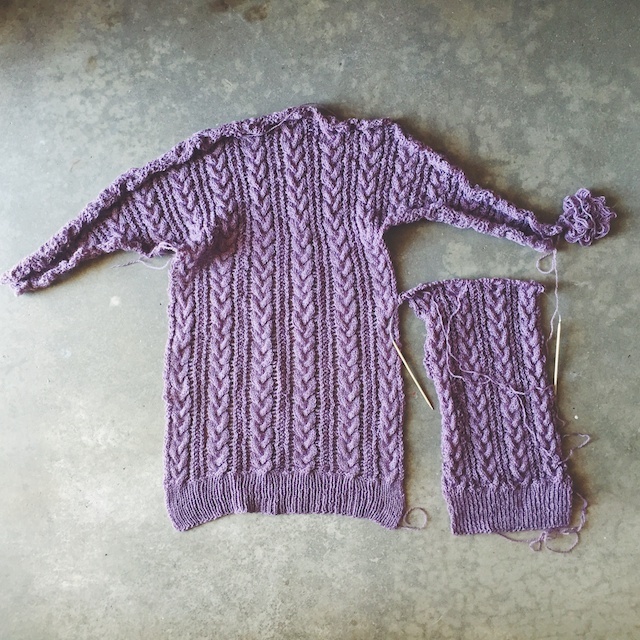 Twenty Ten, up top, is such a fast knit, but it's also been set aside for the KAL. 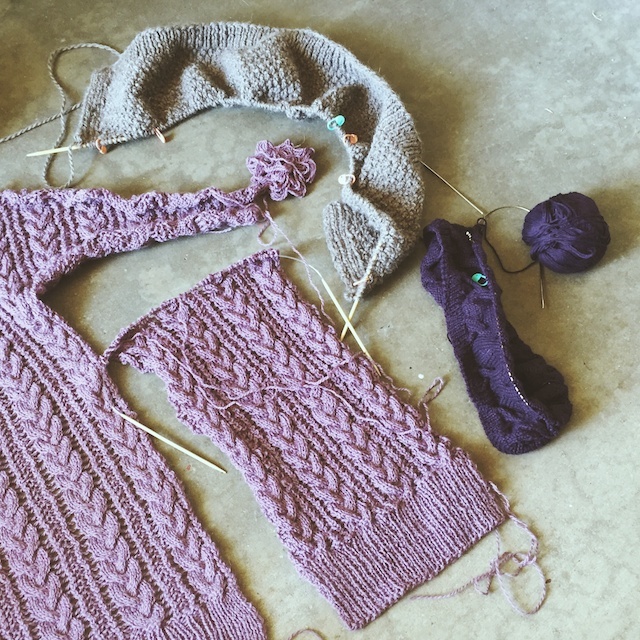 There's a second Fire Opal Tee, in blackberry in the bottom corner, which will be a great mindless knit when things warm up. Lastly, I have the very, very beginnings of a Offshore V-Neck sweater that I cast on in the space between something blocking and a yarn order arriving. Why I'd pretend to do damage on this in a few days, I don't know. It was abandoned with a box coming in the mail, and sits in a basket by the couch. The basket is supposed to remind me of things, so I don't forget them and cast on new things. I may need to paint the basket something day-glo. This really isn't that bad. I know my blog sidebar says I have a million projects on the needles, but some of those are just projects I've made Ravelry pages for without actually beginning. See, I'm more organized than I seem. Oh, I miss the days of powering through something until it was done. Of kind of knowing when I'd have an hour to myself, with nothing stressful looming in the background to unsteady my concentration. I miss getting to do more than one thing that's good for me every other day. I miss seeing the phone as a gateway to relationship instead of something to dread. I remind myself this is just a season in my life. Sometimes that makes me feel better, sometimes it sounds trite. Enough of that. Obviously, I've had enough time to myself to finish the back and half of a front of this sweater, when I'm sure plenty of reading and television watching occurred. Now I'm going to go run for a bit before anything else comes up. By the way, have I ever told you how much you cheer me up? You do. I was feeling beyond blah when I started this post, now I'm about to burst out of my front door at a full trot. Thank you blogging/ knitting/ crafting/ instagram-ing friends! I love your blog! I always read it. And when it comes to monogamous knitting, I say do what makes you happy. 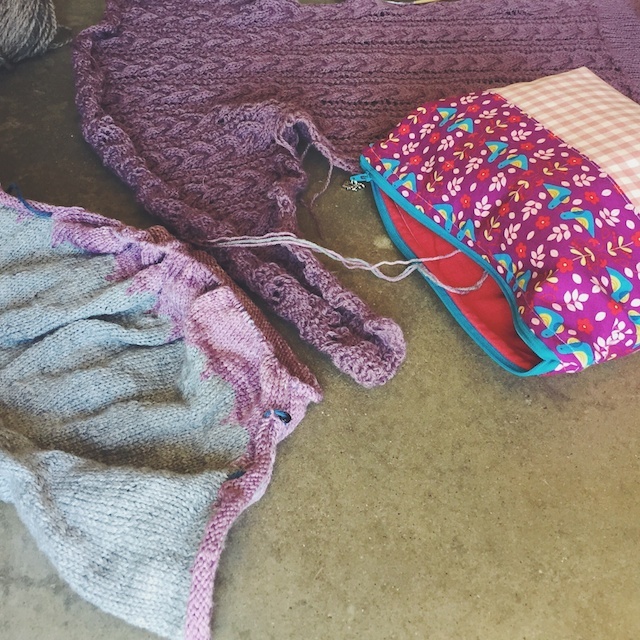 As soon as knitting starts feeling like a chore or obligation or another thing to check off a list of some kind, I know it's time to switch projects. I'm more of a monogamous knitter, especially now that I don't have a lot of time and I also dedicate part of my free time to sewing. Having lots of UFOs also makes me a bit desperate. Just take it easy and do one thing at a time, and before you know, all those projects will be finished. Don't stress out about deadlines and enjoy the process. It hurts me seeing you like that, worried, stressed out. I hope things work out in the end. I am like a crow - see something shiny and then MUST MAKE NOW. :D I also find that with a long project, I need to take a break from it, or else I'll start getting impatient and start making mistakes. Hense me starting my Cedar Glen mitts and a second attempt at socks. Look at all the pretties! I'm interested to see how your Cafe Au Lait works up as mine came out quite fitted. Isn't our community great for finding cheer when you're a bit low? There's nothing wrong with variety! I just know the cause of mine is change in time to myself and I'm missing it. But, the alternative is not being there for people who need me, and I really don't want that. I guess I'm nostalgic for the days when everyone was feeling good and things were a bit easier. Thanks for the boost. Thanks for your sweetness, Elena. I'm not worried about knitting, not really. I am at a weird place in my life of caring for my grandparents as they near the end of their lives. They had a very bad week last week- high blood pressure scare, my grandfather getting out of his assisted living center and walking far down the road at night, and another resident's grandson stole some of their medication. It was unusual and awful. I was at home helping my sister recover from major eye surgery and not really able to be there for them during a couple of those things. It's just a hard time, where I felt inadequate and worn out. Logically, I know I'm doing what I can and should. But, like you hurt for me, I hurt for them, you know? That's just how it is when you care about people. I do think next week will be back to normal. Thanks so much for caring. Your's is beautiful Faith! Did you want it to be fitted? I want everything oversized lately. I'm reliving my youth and baggy clothes, I suppose. More fitted may be more flattering for me, but I've already decided to make the smaller size at a slightly looser gauge for the back, and then I'm knitting the fronts according to the next size up, to make sure it buttons up easily. So far, it seems to be knitting up with a few inches of ease. 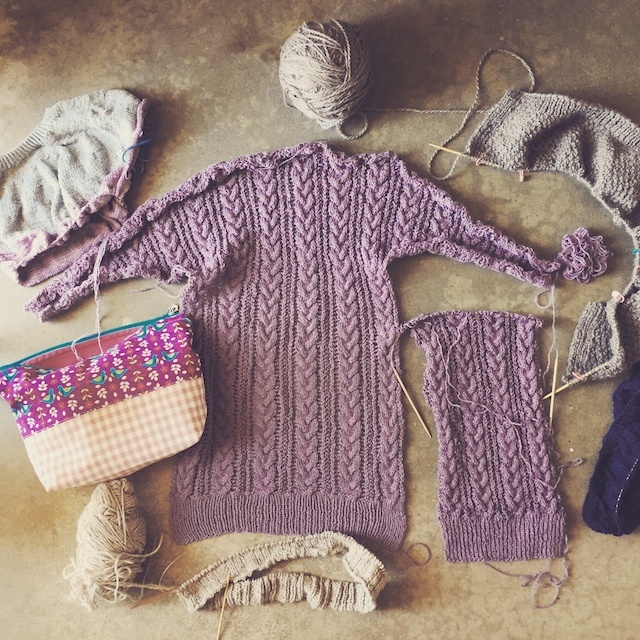 "I haven't shifted my expectations to match my decreased knitting time." Oh how familiar that sounds ... I really, really need to shift mine. I love the colour of your sweater. Thanks, Annie. I'm taken with it, too. All photos and content © Michelle Carter unless otherwise stated. Powered by Blogger.